Royal Caribbean announced several cruise ship deployments from itineraries that have long been open for bookings. The changes affect more ships than usually: Empress of the Seas, Majesty of the Seas, Enchantment of the Seas, and Vision of the Seas. Empress of the Seas will have its Miami season extended and won’t return to Tampa in May 2018 as planned previously. All Empress sailings starting March 2018 will stop in Havana, Cuba. Passengers already booked on Empress sailings. Majesty of the Seas will no longer homeport to Tampa, moving instead to Port Canaveral in May 2018 and will take over the itineraries scheduled for Empress. 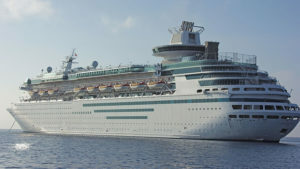 Passengers on the previously scheduled Empress will be moved to Majesty of the Seas. Enchantment of the Seas will move from Galveston to Port Canaveral beginning June 2018. Enchantment sailings between June 23, 2018, and March 13, 2019, as well as April, 2019, have been canceled as a result. Vision of the Seas will stop sailing from New Orleans in March 2019. Instead, it will move to Galveston for the winter season. Sailings on Vision between March 9, 2019, and April 13, 2019, have been canceled. Some cruisers will simply move from one ship to another, but other cruisers have been informed that their cruises are canceled and they can either rebook on another ship or they will be offered a full refund. This entry was posted in Port Canaveral, Royal Caribbean International (RCI), Travel, Vessels and tagged cruise ship, cruise travel, port canaveral, Royal Caribbean International, vacation by writer. Bookmark the permalink.